Ever since I began a research project to examine Theodore Roosevelt’s image in popular culture, I cannot help but see him everywhere. Even so, I hardly expected to find him on a political mural in Northern Ireland, let alone three such shrines. Painted murals in Northern Ireland adorn the façade of many buildings. They depict the country’s political and religious struggles, most often referring to the decades of violence that began in the 1960s. The murals typically portray one side’s perspective. Republican murals showcase nationalist heroes such as hunger striker Bobby Sands and IRA gunmen who died in combat. Conversely, loyalist or unionist murals include Britain’s Union Jack flag and the portraits of monarchs. Figures of international reputation are not uncommon in either republican or loyalist renditions. Americans like Rev. Dr. Martin Luther King, Jr., Malcolm X, and Leonard Peltier appear as symbols of civil rights activism admired by the Irish as much as Americans. So how did Theodore Roosevelt find his way onto these walls and into the tumultuous social debates in Northern Ireland? In fairness, he is not the only U.S. president to be honored in such a way. 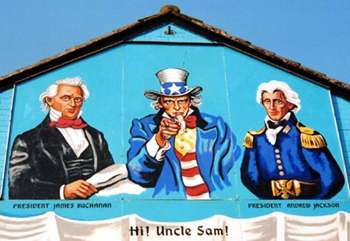 George Washington, Andrew Jackson, James Buchanan, and even Confederate President Jefferson Davis appear on public murals in Northern Ireland. These presidents—Roosevelt included—share a common ancestral bond as Scots-Irish Americans, that is, Protestants with genealogical ties to Ulster, the northern province of Ireland. In Ulster, American presidents represent the outstanding achievements of the Scots-Irish in the United States and because of their religious affiliation are applied by artists to distinguish the ethnic identity of Northern Irish Protestants. 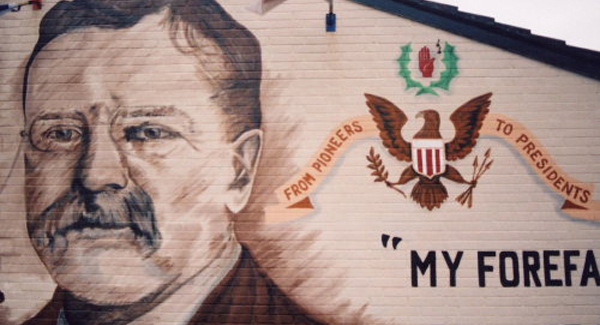 The murals also attempt to build closer associations with Americans of the same religious background and bolster unionists’ claims to the political leadership of Ulster. The Presbyterian Irish were themselves already a mixed people. Though mainly descended from Scotch ancestors—who came originally from both lowlands and highlands, from among both the Scotch Saxons and the Scotch Celts,—many of them were of English, a few of French Huguenot, and quite a number of true old Milesian Irish extraction. They were the Protestants of the Protestants; they detested and despised the Catholics, whom their ancestors had conquered, and regarded the Episcopalians by whom they themselves had been oppressed, with a more sullen, but scarcely less intense, hatred. They were a truculent and obstinate people, and gloried in the warlike renown of their forefathers, the men who had followed Cromwell, and who had shared in the defence of Derry and in the victories of the Boyne and Aughrim. This is among the most regularly revered statements by Northern Irish unionists. Not only does Roosevelt indicate the distinctiveness of the Scots-Irish, he celebrates their exceptional history as defenders of the faith. TR’s recollection of two sacred victories for Northern Irish Protestants—the Battle of the Boyne and the Siege of Derry—has since endeared him to generations of unionists. The defense of Derry particularly stands out. When Catholic King James II invaded Ireland in an attempt to win back his monarchy, he laid siege to Derry. The city starved and suffered, yet its Protestant population refused to surrender to the Catholic king’s army. Eventually Derry was relieved by Dutch prince William of Orange, later crowned William III of England. No wonder that Ulster’s loyalists felt the need to include Roosevelt. He too was a Dutch Protestant with a self-declared association to the Scots-Irish. Every August the city of Derry celebrates the salvation of the city by William of Orange. Organized by the leading Protestant groups, a day-long parade begins down Wapping Lane, past the Roosevelt mural. While Roosevelt’s image was never part of the official celebration, for nearly 10 years he loomed over the parade as it made its way through the first leg of the march. However, the murals are an ever-changing canvas, and in 2009 Roosevelt was painted over. Although gone, the now historical mural shows just how international the memory of Theodore Roosevelt can be. His legacy belongs to the world, and while he is remembered most in his own country, there are millions that celebrate his life abroad. 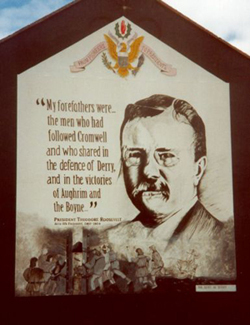 Image credit: Photographs were supplied courtesy of the Northern Ireland Mural Directory. Dr. Michael Patrick Cullinane is senior lecturer in U.S. history at Northumbria University in Newcastle-upon-Tyne, England. He is the author of Liberty and American Anti-Imperialism, 1898-1909 and is currently working on a book that traces the public memory of Theodore Roosevelt from 1919 to the present day.